JERUSALEM - A Jerusalem court on Monday convicted two Israeli youths in the grisly killing last year of 16-year-old Palestinian Mohammed Abu Khdeir, while delaying the verdict for the third and chief suspect in the case due to a last-minute insanity plea. The killing of Abu Khdeir, who was burned to death, was in revenge for the killing of three Israeli teens in the West Bank - slayings that set off a chain of events that led to the 50-day Gaza war in the summer of 2014. Monday's verdict could further increase Israeli-Palestinian tensions amid a two-month wave of violence that has been convulsing the region. In the ruling, Judge Jacob Zaban of Jerusalem's District Court determined that the ringleader, 31-year-old Yosef Haim Ben David, and two Israeli minors - whose names were not released - snatched Abu Khdeir off an east Jerusalem sidewalk in July 2014 and burned him alive in a forest west of the city. The judge determined that Ben David drove the car while his two accomplices beat Abu Khdeir unconscious in the back seat. Once they reached the forest, one accomplice helped Ben David douse Abu Khdeir with gasoline. Then Ben David lit the match, according to Zaban. The Palestinian youth's death triggered violent protests and was a milestone in an escalation of violence that led to the Israel-Hamas war. The three suspects were arrested shortly after the July 2, 2014 abduction and confessed to the killing to investigators with Israel's Shin Bet, the security agency said. According to the agency, they said that Abu Khdeir's slaying was in revenge for the abduction and horrific killing of three Israeli teens - Eyal Yifrah, Gilad Shaar and Naftali Fraenkel - by Hamas operatives in the West Bank. The killing of the three triggered an Israeli crackdown on Hamas in the territory, to which the militant group responded by stepping up rocket fire on Israel from the Gaza Strip, which it controls. The confrontation evolved into the 50-day-war that killed more than 2,200 Palestinians, the majority of them civilians, according to U.N. figures. On the Israeli side, 73 people were killed, most of them soldiers. Last Thursday, Ben David's attorney Asher Ohayon submitted the insanity plea. Zaban said it would be examined separately, "despite regular and appropriate protocol" later in December. Prosecutor Uri Corb said Monday that the Abu Khdeir case was a stain on Israeli society. "When we try to claim we are better than our enemies ... we will always have this incident as a mirror," Corb said. 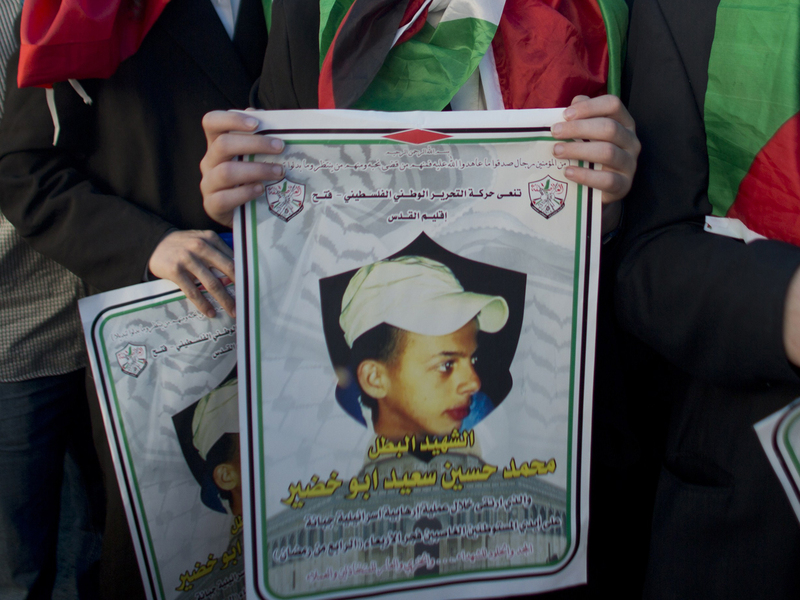 Abu Khdeir's father Hussein denounced the verdict. "This is a lie," he told Israeli Army Radio. "I am afraid that the court will release them (suspects) in the end." Hamas condemned on Monday what it called "the exoneration" of Ben David, describing him as the Jewish settler who killed Abu Khdeir. "This is an evidence of the occupation's racism and its sponsorship of the settlers' crimes against the Palestinian people," Hamas said in a statement. The two convicted minors will be sentenced in mid-January. One of them had claimed during the trial that he did not realize the three of them would kill Abu Khdeir while the other said he took part in strangling the Palestinian youth inside the car and pouring gasoline on his motionless body. Ben David did not testify. Israeli law prohibits publishing names of minors on trial. The two minors were 16 years old at the time of the crime, according to attorney Avi Himi, who is representing one of the youths. The maximum sentence for minors is life imprisonment, according to attorney Lea Tsemel, who often represents Palestinians in court. Israel has mandatory life sentence for adults convicted of murder. In a case related to Abu Khdeir's death, a Jerusalem court earlier this month sentenced a police officer to six weeks of community service for beating the Palestinian youth's cousin, 15-year-old Tariq Abu Khdeir, of Tampa, Florida, during a July 2014 protest over Mohammed's killing. That ruling has been criticized as too lenient. Monday's convictions come amid a two-month wave of unrelenting bloodshed between Israelis and Palestinians that has left 19 Israelis and at least 98 Palestinians dead, including 63 said by Israel to be attackers. On Sunday, Israeli police killed a 17-year-old Palestinian in east Jerusalem who Israel says was throwing a firebomb at Israeli forces.